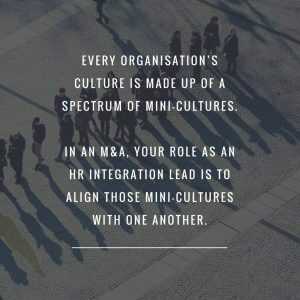 If you are an HR manager about to take part in an M&A, how big a concern is corporate culture? Or if you have taken part in an M&A, when did the corporate culture become a talking point? This article explores how to tackle the key facets of culture during an M&A. When you think of corporate culture during or after a merger, did you find yourself using phrases like “oil and water” or “chalk and cheese”? These phrases tend to set up a us vs. them mentality from the start, which once established, is very difficult to shake off. The key perspective for an HR integration lead, is that regardless of the history of the merging companies, the reality is never as drastic as that. Big monolithic organisations have radical, innovative risk-takers in them. They won’t be front and centre, but they’re there. Equally, maverick organisations have safe pairs of hands in them. They aren’t looking to rock the boat, but just provide a level of stability to an already chaotic disruptive environment. They’re the ones you turn to when you need it done right. 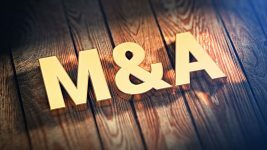 We’ve been very lucky in MergerWare to be front and centre to some very big M&A deals. And in each of them, communication has been the key driver for success for an HR integration lead. You are responsible for ensuring that the shared vision is articulated clearly. 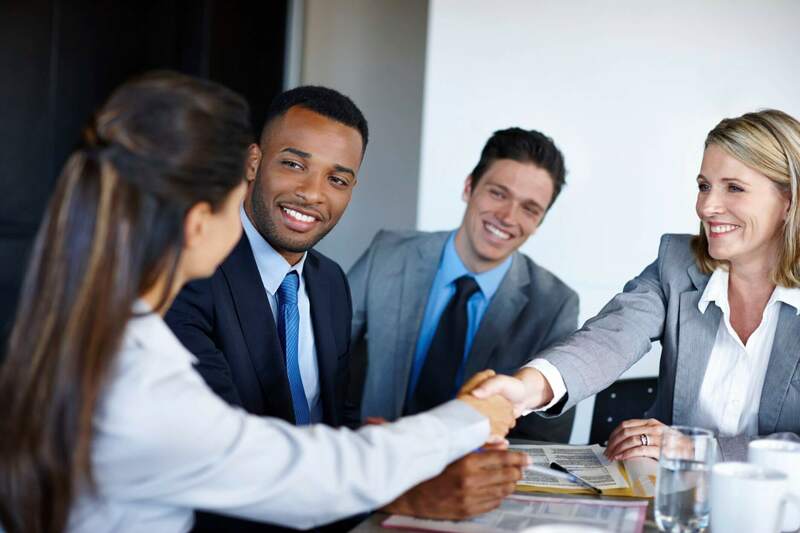 And not only are you the the first line of defence to retaining top talent, but also for ensuring that any complaints during the transition are being listened to and clearly acted on. 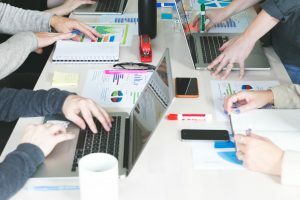 From that perspective, defining a clear vision and metrics for success are some of the things you need to have mapped out before starting to align corporate cultures. The other consideration is that if the size of the acquirer dwarfs the acquisition, then one culture will most probably absorb the other. But let’s say that the sizes are comparable and that there is a need to have an amalgamated corporate culture that defines the combined entity. 1. Use the new corporate values to your advantage If you don’t have newly defined corporate values, define them! As nerve wracking and tense as a merger or acquisition is, it is also an opportunity to ring in some cultural changes. Use the newly defined vision to create some values that the team can get behind. If you are Internal Comms leader, you will also need to do is define a comms plan that supports the culture re-definition. Like with everything at this high level, there is a danger that this can be seen as a bit of a form filling exercise, or management-speak at best. Therefore, it is important to create some actions off the back of these values. 2. Share existing examples of the “Values in action” across the teams chances are that the values you want to espouse already exist in the organisation in some way. One of the first tasks for you to do is to collect as many of these stories as possible. Reach out to the managers in teams on both sides and see how many examples they can supply that demonstrate that the values we want to hold are within reach. Publish those stories on a regular basis in a shared and visible platform. 3. Nominate champions to drive momentum the level of buy-in is tied closely to how many people you can get to champion the cause. While you are collecting the examples in #2, also make note of the people behind the stories. How many of them have demonstrated a positive attitude on a consistent basis and have the ability to influence a large group of people? • Go on a road-show to different offices speaking about the envisioned culture. Let the champions define how they want to do it, but ensure that they are made up of people from both the acquirer and acquired organisation. • You may also want the champions to kick off a discussion or conduct a survey on cultural differences. Don’t let the unsaid differences be the elephant in the room, shine a light on them. Survey questions can be based on: accountability & escalation, decision making, meeting norms, communication. • Raise awareness within the integration teams on cultural differences during the kick-off meeting. Ensure follow-up on culture is part of any central comms plan. 4. 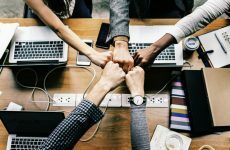 Create incentives while none of us are fans of incentivising people to do good for the organisation, it is equally important to establish some momentum. Be careful though, because if you take this too far, then the behaviours will drop as soon as the incentives stop. 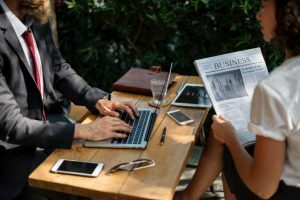 Not only should you incentivise your champions to take their role seriously, and have some regular metrics to ensure that they are continuing their work, you should also give them a public forum to showcase their efforts. The champions in turn, should be able to incentivise people that have engaged with them. This doesn’t have to monetary, recognition by your peers can be a great incentive as well. 5. 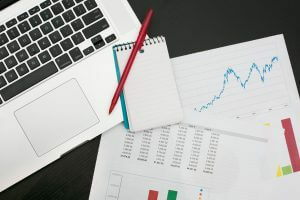 Measure, measure and measure everything from 1 – 4 should have some metrics that sit behind it, ensuring that you are making progress on your agenda. Culture is something ingrained in an organisation, so to say that if you follow 1-4 would establish a culture would be foolish. However, what 1-4 does is lay the groundwork for the culture to shine through. We think about them like “culture crutches” which help develop a repeated behaviour. Repeated behaviour creates habits. Habits over time create a culture. Previous PostBREXIT – An example of missed integration or a lack of leadership?